In honour of BC’s family day I made this crafty piece. 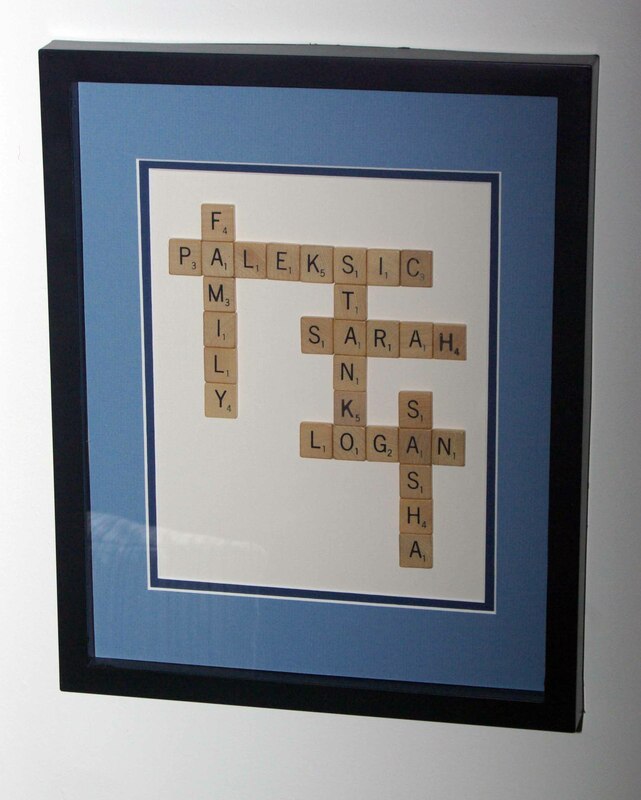 Our names just happen to work together to make this scrabble like piece. To create this on your own start with a shadow box (this one is 11×17), or a frame deep enough that you have space for the tiles between the glass and the back. Then using matte board cut the piece that you are going to glue the letters on to, I took the back of the frame off, traced it and cut it with a utility knife. Next using letters from a scrabble game I bought at a thrift store, I laid out the names, making sure that there was equal spacing on all sides. Then using painters tape I made straight lines on the matte board to use as a guide when hot gluing the letters on. You could draw pencil lines on too, but the painters tape is faster in my opinion. Next using hot glue attach the first word to the matte board, continue placing painters tape, and attaching letters until all of the words are spelled out. I taped the blue matte (11×17 frame with a 8×10 opening) using double sided tape onto the matte board with the letters. Assemble the matte into the frame, and that’s it. This craft should take an hour or so. Happy Family Day, and happy crafting. Family Day in BC is Monday Feb 8. Why not make a family craft?